Princess Eugenie, an art gallery director, married her businessman boyfriend at Windsor Castle. The granddaughter of Queen Elizabeth is ninth in line to the British throne. Crowds gathered outside Windsor Castle on Friday as Princess Eugenie, granddaughter of Queen Elizabeth, wed her longtime boyfriend Jack Brooksbank. The couple married at St. George's Chapel, the same venue as Eugenie's cousin Prince Harry and Meghan Markle, now the Duchess of Sussex. Eugenie, 28, is the daughter of Prince Andrew the Duke of York, and his ex-wife Sarah Ferguson. She is a director of the Hauser & Wirth art gallery in London. Brooksbank, 32, works for Casamigos, the tequila brand owned by George Clooney and Rande Gerber. The pair met on a skiing vacation in Switzerland in seven years ago, and Brooksbank proposed in January when the pair were in Nicaragua. The Queen and her husband Prince Philip were in attendance, as well as Prince Harry and Duchess Meghan, Prince William and his wife, Catherine, Duchess of Cambridge. William and Catherine's children Prince George and Princess Charlotte were on hand to serve as a page boy and bridesmaid. A host of celebrity friends were also in attendance, including actresses Liv Tyler and Demi Moore, models Kate Moss and Naomi Campbell, and singer Ellie Goulding. Eugenie's parents, who maintain a close relationship, both expressed their joy at the marriage. Prince Andrew called Brooksbank "an absolutely outstanding young man...I'm really thrilled for them." "We love Jack and I'm so excited to have a son," Sarah Ferguson wrote on Twitter. The bride's dress was designed by British-based designer Peter Pilotto. 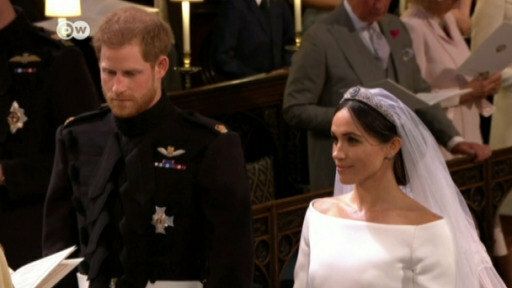 Britain's Prince Harry and US actress Meghan Markle exchanged marriage vows before a star-studded crowd in Windsor Castle's chapel. The couple – now known as the Duke and Duchess of Sussex – put their own touches to the ceremony. 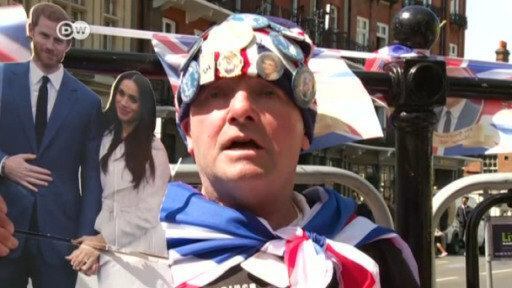 Excitement is mounting in the UK ahead of Prince Harry's marriage to Meghan Markle. Crowds are gathering outside Windsor Castle, where the wedding will take place. More than 100,000 people will throng the town to catch a glimpse of the newlyweds.